Born on December 10, 1830, American poet Emily Dickinson’s reputation precedes her. Painted as an eccentric recluse, a spinster with a penchant for white dresses, the legends that have attached themselves to Dickinson are not only hard to shake, but often far from the truth. 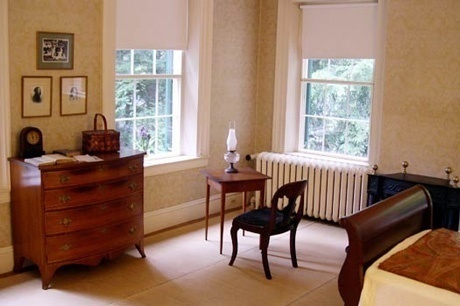 Growing up in Amherst, Massachusetts, in a house (The Homestead) built by her grandfather, Emily was born into one of the most prominent families in town. 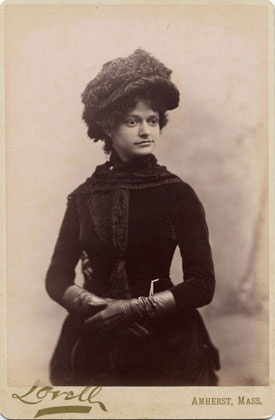 Surrounded by formidable men, Dickinson’s grandfather founded Amherst College; her father, Edward, was elected to the US House of Representatives, and her brother Austin would go on to become Treasurer of Amherst College. With a family as crowded by achievement as the Dickinsons, Emily could have been forgiven for choosing obscurity. Her complicated relationship with her own talent meant that in refusing fame, she subsequently became the subject of gossip and rumour. With siblings Austin and Lavinia born in 1829 and 1833, Emily left home for the first time in 1840 to study at Amherst Academy. Receiving a good education, Emily discovered a love of botany, which was to become a lifelong passion. Aged 17, Emily finished her education at Mount Holyoke Female Seminary, returning home in August 1848. Her homecoming was not the end of her education. What Amherst lacked in size, it more than made up for with ambition, a fact that would not have been lost on Emily. A town that refused to think small, it was a local epicentre of religious reform and political debate. We know that Emily regularly attended lectures during this time, and met Austin’s university friends during parties held at The Homestead. Emily was never starved for intellectual stimulation; finding room for her own thoughts proved infinitely more challenging. Emily had already begun writing as a teenager, and in 1852 had her first poem (anonymously) published in the Springfield Daily Republican. Abandoning traditional ways of organising verse, the idiosyncratic style of Emily’s writing – intense bursts of densely-layered poetry punctuated with breathless dashes – made her poems instantly recognisable. Choosing not to deal with certainties; Emily instead explored what existed between the cracks; what lay between life and death, religion and atheism, the ethereal and concrete. In an age where knowledge of the natural world was put at a premium, Emily was looking at what could not be classified. Reading even her early work, it is clear that Dickinson was staging a one-woman revolution. In one of her most famous poems, The Soul selects her Own Society, the dashes hang in the air, hovering between one idea and the next. In 1856, Austin married one of Emily’s childhood friends, Susan Gilbert. Austin and Sue moved into the house next door to The Homestead, naming it The Evergreens. Happy to continue socialising with Austin, Sue and their circle of friends, Emily’s creative energies were quick to develop. Dickinson began collating her poems into small packets called ‘fascicles’. During this period (1858-1861), Emily also began to write the first of a series of drafts known as the Master Letters. Written to an unknown recipient (despite being prepared for mailing, they were never sent), the letters have been the subject of considerable debate, with many trying to ‘unmask’ the Master: candidates have included editor-in-chief of the Springfield Republican, Samuel Bowles, family friend Rev Charles Wadsworth and even Emily’s sister-in-law, Sue. The letters are the strangest chapter in Dickinson’s career: they were assumed at first to be love letters, but the jumble of meanings, designed to be untangled like a ball of wool, had more in common with Emily’s poetry. It was a clue that these were not ‘letters’ in the strictest sense, but an experiment. These letters acted not only as a creative outlet, but a personal one as well. I enclose my name – asking you, if you please – Sir – to tell me what is true? Also enclosed with the letter was a small bundle of poems. Even to an experienced writer like Higginson, this delivery must have seemed, in every sense, extraordinary. The two kept in touch and Higginson travelled to Amherst in 1870 to meet the poet. Dickinson’s poetry evolved at a frantic pace, but it is clear that she did not work in isolation. Emily immersed herself in the latest literary trends, regularly receiving batches of the latest books, and it was an era bustling with talent. Titles such as Wuthering Heights, Bleak House, The Scarlet Letter, Anna Karenina and Middlemarch were all published during Emily’s lifetime. The density of literary achievement saw novelists take centre stage, but poets and playwrights also made themselves heard, with Matthew Arnold’s existentialist Dover Beach published in 1867, and the first performance of Ibsen’s A Doll’s House taking place in December 1879. It was a particularly rich period in literature’s history, but even in this starry collective, Dickinson shines hard and bright. Compare her work to that of her contemporaries and the difference is not just striking, but vast. Although aware of what was going on in the literary world, she never took steps to become part of it. Emily’s refusal to publish work under her own name is a decision that has never been fully explained. Amherst native and author Helen Hunt Jackson, who published some of Emily’s work in an 1878 anthology, scolded Dickinson her for refusing to give her name to her work, saying :“You are a great poet – and it is a wrong…that you will not sing aloud.” Emily’s instinct not to publish may have been the right one. A collected volume of her work did not appear until 1890. Edited by Mabel Loomis Todd and Thomas Wentworth Higginson, Todd made the controversial decision to ‘tidy up’ Dickinson’s work, to make it more palatable to contemporary tastes. 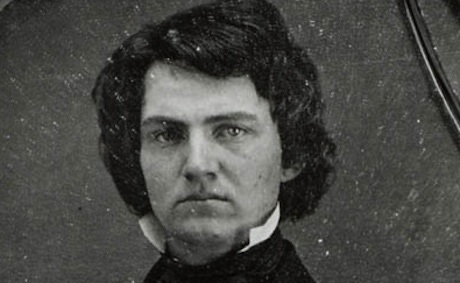 Todd wiped out Dickinson’s use of irregular capitals and dashes, erasing the energy and flow of Emily’s poems. Mabel Loomis Todd was a controversial choice for editor: a friend of the Dickinson family, she holds a notorious spot in the story. Fiercely attracted to each other, Mabel and Emily’s brother Austin instigated a 13-year affair that became a public scandal. It was not until 1955 that the first complete edition of Emily’s poems was released. Edited by Thomas H Johnson, he referred back to Emily’s original manuscripts and arranged the poems in chronological order. For the first time, readers could observe Emily’s journey as a poet. The edition was a huge hit, and initiated a surge of critical interest in Dickinson. Johnson’s masterstroke was then to follow the poems with a three-volume edition of Emily’s letters in 1958. They proved crucial to biographers in piecing together the scant details surrounding Emily’s life and relationships. Emily’s critical reputation grew through the 20th century, culminating in the definitive biography written by Richard B Sewall in 1974. Sewall expertly stitches together Dickinson’s life, cementing her reputation as a major American poet, deserving of a major literary biography. Emily has often proved a difficult subject for biography, with a seemingly uneventful life at first glance. It is not that surprising, therefore, that new biographies have been shortcoming. With the release of Lyndall Gordon’s work Lives like Loaded Guns: Emily Dickinson and her Family’s Feuds in 2010, the notion that Emily lived a quiet life while writing incredible poetry was blown apart. Emily did not need to leave The Homestead for drama, theorised Gordon. It was all there under one roof. As a witness to Austin and Mabel’s 13-year affair, Emily was caught between loyalties to her sister-in-law and brother. As the affair progressed, the resulting emotional fall-out was nothing short of incendiary. The affair tested Emily and her family severely – life at Amherst was indeed a loaded gun. Gordon’s most radical overhaul of Emily Dickinson’s story has been in tackling why Emily suddenly became reluctant to leave home. Emily’s reclusive behaviour dates from 1865, coming just after her treatment for an eye complaint. The decision by Emily to shut herself away, Gordon argues, is not so much a selective act, but a choice made to spare her family from any further scrutiny. Gordon suggests that Emily suffered from bouts of epilepsy. We know that members of Emily’s family had seizures, and it is entirely plausible that Dickinson’s eye disorder pointed towards a hereditary form of the disease. The condition was becoming more readily understood, but epileptics were still subject to social stigma. Coupled with the unpredictable nature of seizures, this could go some way to explaining Dickinson’s desire to stay at home. Addressing that other legend surrounding Dickinson, Gordon’s theory neatly offers up a reason for Emily’s predilection for wearing white. Dickinson’s love of the colour was such that her wardrobe was filled with identical white gowns; she met Higginson wearing white, and even asked to be buried in a white casket. The sartorial choice was at first labelled as an act of eccentricity, a tribute to Wilkie Collins’ emotionally disturbed heroine from The Woman in White (one of Emily’s favourite novels). But placed against the possibility of Dickinson being epileptic, white cotton could have simply been a practical choice for someone experiencing regular seizures. Easy to bleach clean, the truth behind the romantic legend may have been far more prosaic. Emily most readily confessed her deepest thoughts in poetry, and it is the poetry that convinces: ‘I felt a Cleaving in my Mind’, re-read against Lyndall’s thesis, describes the moments just before a seizure. Like Balls — upon a Floor. 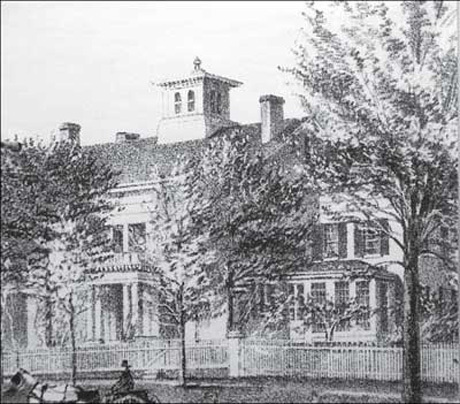 As Emily withdrew from Amherst society, the new generation of Dickinsons were making an indelible mark on the town, with Austin’s appointment as Treasurer of Amherst College made official in 1873. With Edward Dickinson dying in 1874, and their mother, Elizabeth, suffering a stroke the year after, the family were moving into a period of uncertainty. This upheaval was compounded by even greater changes in 1881. Arriving to take up the post of Professor of Astronomy at Amherst College, David Todd moved into the town, bringing with him his wife Mabel. David and Mabel socialised regularly with Austin and Sue, and Austin found himself increasingly drawn to Mabel, an intelligent, vivacious woman 27 years his junior. Between 1881 and his death in 1895, Austin conducted an affair with Mabel, with encounters often happening at The Homestead. In the final years leading up to her death, Emily began conversing with family friend, Judge Otis Phillips Lord. Existing drafts of letters suggest that Emily even considered marrying Otis. However, Emily’s health began to fail and on May 15 1886, she died at the family home. In the weeks after Emily’s death, her sister Lavinia undertook a purging of Dickinson’s extensive body of letters, acting on Emily’s wishes, who did not want her personal letters to become public property. Finding a locked box in Emily’s room, Lavinia opened it. Stashed inside were over 1,800 poems, charting the entirety of Dickinson’s literary career. Unsure of how to proceed, Lavinia approached Higginson and Sue for help with publishing Emily’s work. Higginson was preoccupied with other projects and Sue did not respond as quickly as Lavinia wanted, so she contacted Mabel Loomis Todd. The fight to gain control over Dickinson’s legacy began. Mabel’s 1890 edition of Emily’s poems, reworked to more closely resemble the poetry of the day, was followed by a second book in 1891. Following Austin’s death in 1895, relations between the Dickinsons and Todds disintegrated to such a point that a lawsuit ensued between them, the families squabbling over a tiny piece of land. With communication between the Todds and Dickinsons at an all-time low, Mabel staged a power play, refusing to give back the poems and family letters in her possession. In 1899 Lavinia Dickinson died, breaking the stalemate between the Todds and Dickinsons. Emily’s niece, Martha Dickinson Bianchi, inherited custody of her aunt’s poems. The opportunity to present Emily’s legacy from the Dickinson’s perspective was there for the taking. Martha published a selection of Emily’s poems, most crucially, presenting them exactly as they had been written. Mabel Loomis Todd, along with her daughter Millicent Todd Bingham, endeavoured to use the poems and letters still in their possession, with Millicent completing her mother’s project in 1945. The collection, titled Bolts of Melody, was the final keynote in the story of the Todds and Dickinsons, with Millicent gifting the letters and poems to Amherst College. After the unsavoury battle over Emily’s legacy, Dickinson’s poetry was finally free of the family ties. Her literary reputation emerged unsullied, with Dickinson’s achievement put on a par with her fellow American, Walt Whitman. Her unflinching exploration of autonomy and religious doubt created a voice that was as startling as it was unique. Producing poetry that was semantically and formally so out of its time, the fact that Dickinson didn’t find her audience until the 1950s feels right somehow. Rediscovered during the Beatnik era, her bold vision always had more in common with Jackson Pollock than Winslow Homer. As the myths and legends surrounding Dickinson are excavated to reveal a more truthful picture of her life and work, what we are left with is a writer who dedicated her life to pursuing poetic expression in its purest form. In what she wrote, in the way she presented and perceived her work, Emily was, in truth, America’s first modern poet. Now stripped of the scandals and lies, one of literature’s most audacious pioneers can be recognised for her most enduring legacy: poetry without walls. HelenTope was educated at the University of Plymouth, graduating in 1998.She now works at City College Plymouth and has been a regularcontributor to fashion website Models Connect since January 2009.